Fringed Pink, also known as Large Pink or Superb Pink, is a perennial herb and forms rather loose clumps of ascending stems up to 60cm in height. Occasionally solitary, more often the inflorescence bears several pink to purple (occasionally white) fragrant flowers. Individual flowers are typically 2.5 - 3.5cm across and each hasfive fringed petals. The narrowly lanceolate opposite leaves are stalkless with leaf pairs joined at the base. Fringed Pink is native to most of Europe from Finland down to Belgium, France, Italy and northern Spain, but it is now very rarely if ever found as a wildflower in Britain. Several subspecies have been described in botanical literature, some of which have only very restricted geographical ranges. This member of the Pink family is found also in parts of northern Asia, and it has been introduced to many other parts of the world including North America. 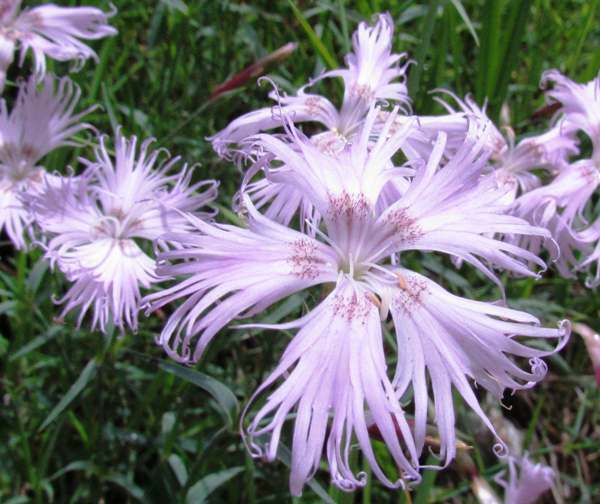 This is a popular flower of cultivation and can often be seen in public parks and gardens. 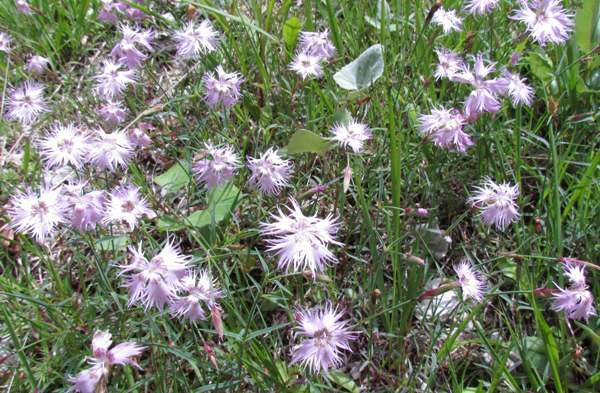 This plant grows on dry, calcareous grassland and on woodland edges, often with sandy soil. In northern Europe this wildflower generally blooms in June, July and August.